It is hard to think of a more beautiful and fragrant flower than that of the rose. But did you know that there is more to this plant than just its aromatic petals? While these petals can, themselves, be enjoyed as a delicious herbal tea, so too can rosehips, the seed pods of roses. If Rose Petal Tea is famous for its scent, then our very finest quality Rosehip Tea is perhaps best known for its astounding health benefits. To begin with, Rosehip Tea is an excellent source of Vitamin C, thus making it a great choice for boosting the immune system. It is also believed to be good for digestive health and can especially aid with gastrointestinal issues. If, however, you are here for taste alone, our Rosehip Tea offers a delightfully earthy-floral infusion, combined with subtle fruity undertones. Whatever you are looking for in your morning cup, you will be hard-pressed to find a better herbal brew than Rosehip Tea. Rosehips are just one component of the Rose plant (botanically known as Rosa of the Rosaceae family). The plant itself is a herbaceous shrub found in both Eastern and Western hemispheres, although it likely originated from Northern Persia (modern-day Iraq and Iran). Rosehips follow after the plant’s flowering season, with their appearance resembling that of small crabapples, this is no coincidence as the two plants are related. Their taste, meanwhile, is distinctively tangy, if somewhat sour. Many say this flavour is reminiscent of cranberries or pomegranates. This unique, tart flavour is just one of the many reasons why you shouldn’t feel down in the dumps when the roses ‘go to bed’. After all, what comes after is equally, if not even more delicious! A notable moment in history for the rosehip actually came during the Second World War when German blockades halted large quantities of vital supplies to the British Isles. Due to the lack of citrus fruits providing the British people with much-needed Vitamin C, many looked to rosehips as a substitute. Consuming rosehip tea prevented scurvy, a deficiency disease caused by the lack of Vitamin C. While the role of rosehips during the Second World War was admittedly small, it might also be fair to label it as relatively significant. Today, that significance cannot be overstated. To find out why, please see our Health Benefits section below. Tasting Notes: Rosehip Tea boasts a stronger flavour compared with our Rosehip Whole. This is largely owing to the process of cutting the fruits which, in turn, brings out a bolder taste. Expect a tasty earthy-floral infusion combined with fruity undertones; perfect for easy afternoon-drinking! Colour in Cup: Peach liquor, light in tone. Rosehip Tea Benefits: Suffering from the sniffles? According to many scientific studies, Rosehip Tea might be the answer. Aside from its concentrations of Vitamin C, this beverage also contains a wealth of other antioxidants known for supporting the immune system. A stronger immune system means a stronger defence against common colds and flu. 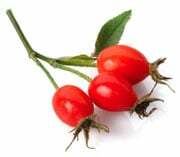 Just some of the vitamins and minerals found in Rosehip Tea include Vitamins A, B-Complex, D, E, K, and P, as well as calcium, carotenoids, flavonoids, magnesium, pectin, potassium, rutin, sodium, sulphur, tannins, and zinc. Further to this, there are also concentrations of ascorbic, citric acid, copper, cobalt, iron. Malic, phosphorus, and silicon.